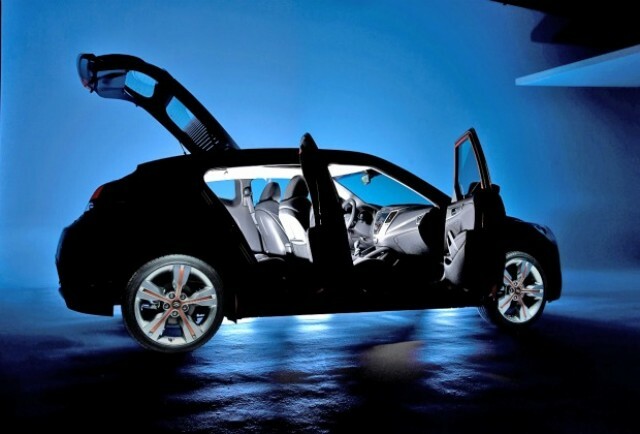 Expected to be reveal at the Detroit Auto Show which is just around the corner, the South Koreans from Hyundai decided to reveal a new teaser photo for the new Hyundai Veloster, a model which is based on the Veloster concept revealed back in 2007 at the Seoul Motor Show. From the photo we can barely see the interior including the dashboard and the back of the seats. The huge wheels together with the special rims are also visible but by far we can see the trunk’s door and its features. In terms of performance, we got some details regarding the propellers that will be packed under the bonnet. The new Hyundai Veloster will replace the current Coupe and will offer firstly a new 1.6-liter engine able to develop 140 horsepower. Lately, a more potent 200 horsepower propeller might be introduced but for now we don’t have any confirmation on this. The South Korean manufacturer announced that the 1.6-liter 140HP engine manages to obtain a decent fuel consumption of just 5,8 l/100 km, the technical details stopping here.